This til ki khichdi is regularly made in my home. 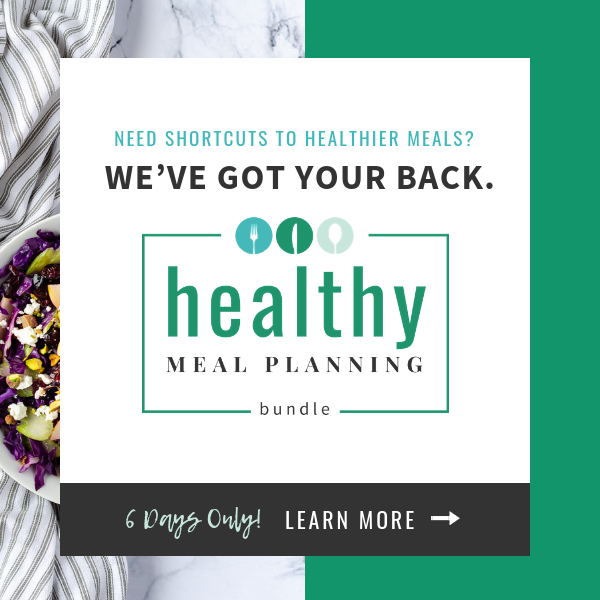 I first came across a similar recipe on Monika’s blog. Then I made this with my own variations and absolutely loved it and so did the family. 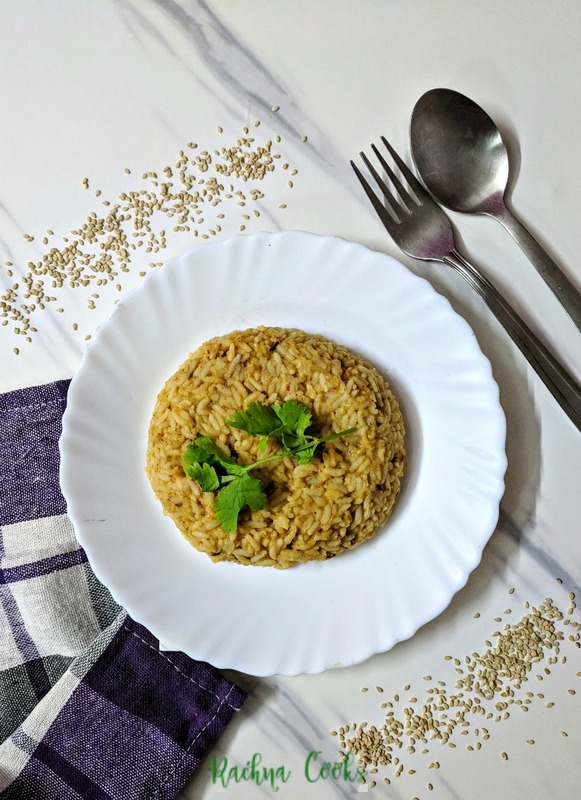 This til khichdi is really quick and fuss free and is loaded with the comforting flavours of sesame seed and other spices. Not to mention how nutritious it is. Whether it is a lazy weekday or a weekend after when you are in mood to cook, this recipe really works well. Oh and I pack it in my kids’ lunchboxes as well. 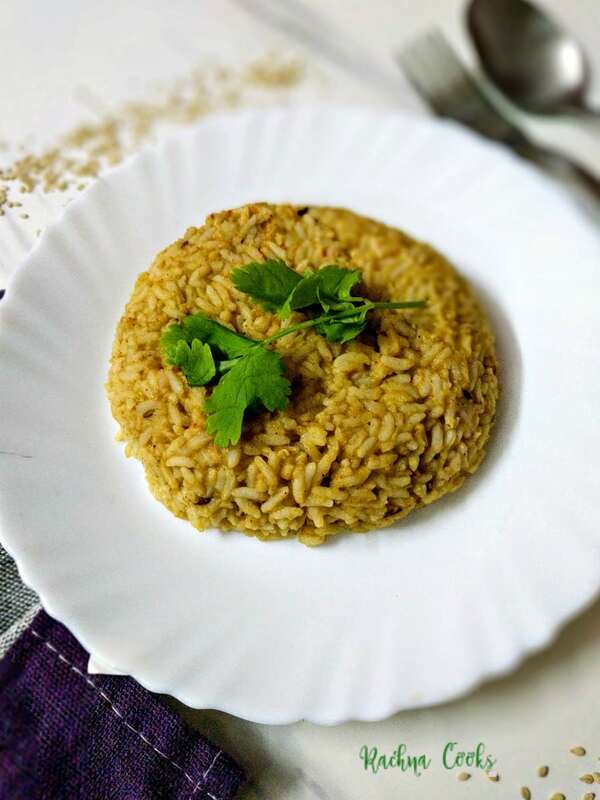 A satisfying, simple and easy to make til ki khichdi is made with lentils, rice, sesame seeds and other spices and tempered with ghee. Finger licking tasty! To make khichdi, wash the lentils and rice well. Now cook them till well cooked in a pressure cooker with water and salt. I use double the water to the rice lentil volume. It takes about 4 whistles in a pressure cooker. You can cook in a pan as well. In a flat tava or pan, dry roast sesame seeds, peppercorns, cumin seeds, coriander seeds and whole red chillies. Then powder them in a blender. Add the masala powder to cooked khichdi with some water. Then mix well. This helps the masala to incorporate all through the khichdi. 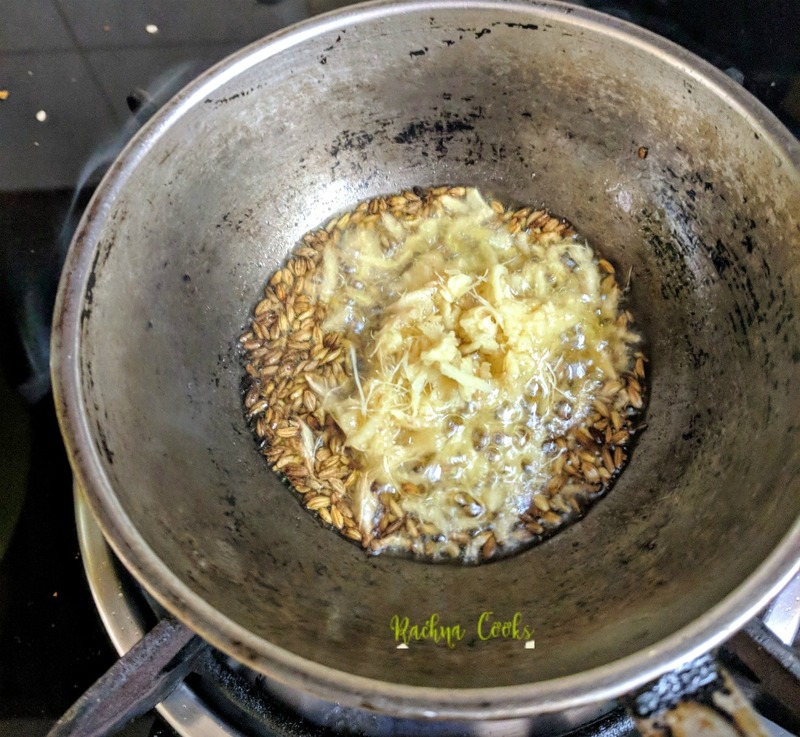 Before serving, heat ghee in a pan. Add cumin seeds, heeng and grated ginger. Cook for a minute and then add to the til khichdi. Garnish with coriander leaves. Your piping hot til ki khichdi is ready to serve. 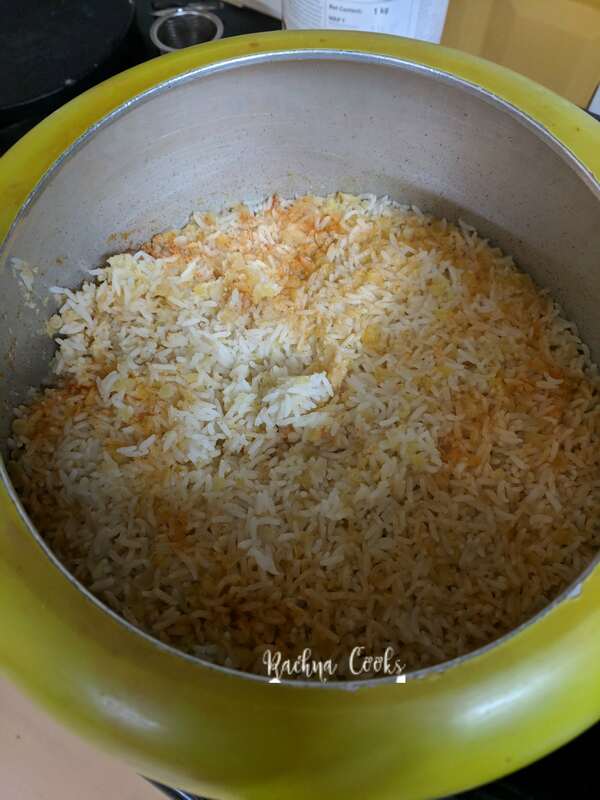 1.You can add more water to the khichdi to make it slightly more loose. I prefer it more dry. 2. You can have this khichdi cold as well as it still tastes delicious. 3. You can adjust the spices as per your taste but keep the sesame seeds the same. Dry roast the spices. Since I had freshly prepared coriander powder with me, I did not roast that here. The tempering to be poured over khichdi. 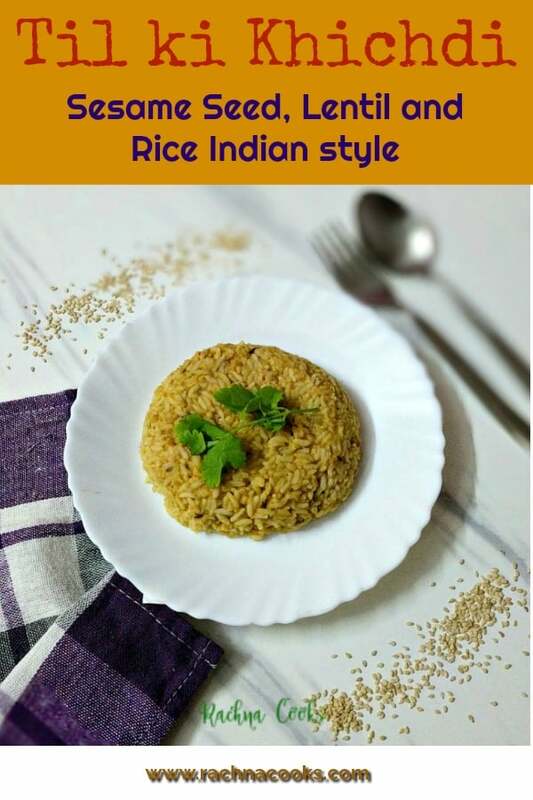 Do also try sabudana ki khichdi and pongal recipes if you enjoy khichdi. Interesting variation of khichadi. 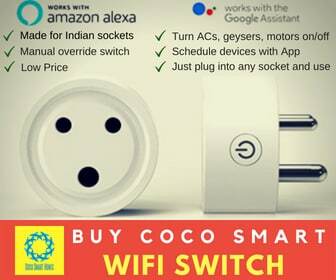 Will try it the next time. Minimalist header! Looks nice, though I miss the luscious red strawberry! I love khichdi! As simple as it is to make, I like making versions of it with added veggies and masalas. This one sounds very interesting and I also love the flavor of sesame seeds. Will make this this week for lunch ? Oh boy I could already smell sesame and ghee. I love the flavor of Sesame but never tried it with khichdi ? Ah, so the Til is in the masala. Somehow I assumed it was going to be used instead of moong when I read the recipe title. Oh this is an easy one. I love khichdi and it’s perfect for those days when I don’t feel like cooking a feast. (Which to be honest, is most days). So essentially the til is the tempering after the whole khichadi is cooked? Why not add the til in the tempering before adding the ricelentil mix and cook it all at once? Will it affect the taste of the khichadi? And why use til? I make a masala khichadi using zeera and curry leaves, turmeric powder and some garam masala. If it is for grown ups, I even add sliced onions which I brown with the tempering. Adding til after khichdi is cooked keeps its freshly toasted flavour intact. You can try cooking it with the khichdi as well. I love the flavour of til which is the prominent flavour here, very different in taste from other khichdis. ? Yes I make masala khichdi too. Treat this as another variation. Try this recipe and see if the taste appeals to you. 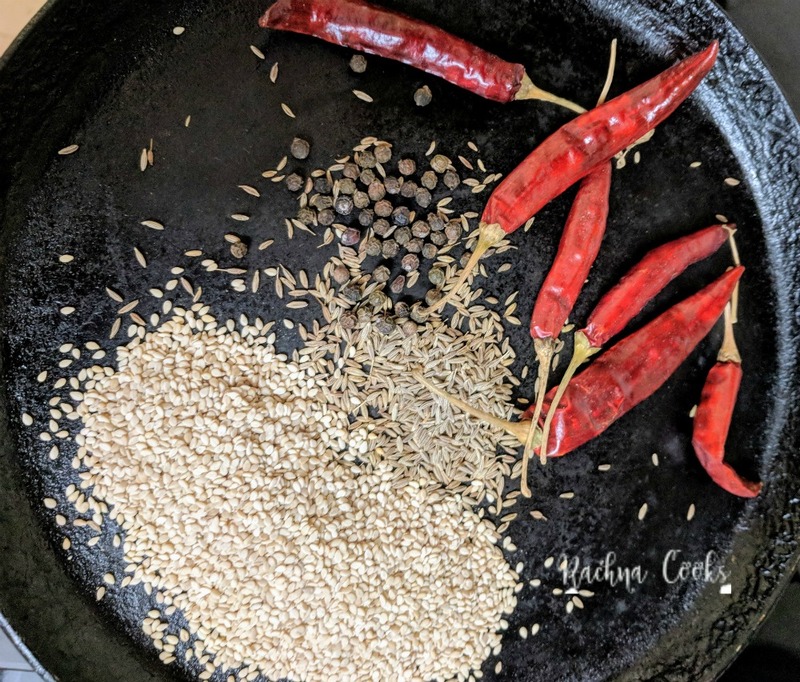 Jumping in to add – we always temper khichdi as well our dals after they are cooked for the same reason – because it brings out the flavour of the ghee and the tempering. I love the flavour of til but have never thought of tempering my chichi with it. Sounds good.